The Delancey bed set is where fun meets comfort. The entire top of the comforter is ruched fabric that makes it look billowy and soft while there are seams down the length of it to provide structure and gives the illusion of a scalloped edge to the end of the bed. This comforter is made from 100% cotton and the reverse is a soft, brushed micro-fiber; making it eye-catching on the top and provide that comfortable feeling you need on the back. I purchased this queen comforter a few weeks primarily because I really liked the look of it. Unfortunately the ruching is not well defined like in the picture. The comforter looks wrinkly and not intentional. I think to make it look like the picture I will have to iron it, which I have contemplated but have not attempted. That being said, it is a really warm comforter. I like that it is machine washable, not dry clean only, and the fabric is nice. It is nice and cottony instead of slick like many newer comforters. It is a bit heavy, so if you like to make a burrito then it is perfect because it stays in place all night long. This comforter has texture, which is something I have not seen with other comforters. This adds a nice feminine touch to a bedroom. I definitely recommend it if you tend to be cold at night and want a practical but unique comforter. - The color is more off-white than bright white. But it is still whiter than cream or ivory. - It does come out the box very wrinkled but I think it settled nicely once it had a few days to air out/fluff up. - I bought a king for my queen sized bed and am happy with that. It is noticebly bigger than my other queen comforters but still fits on the bed and doesn't look too large. - When I removed the tag from the decorative pillow, the seam came undone on the edge and I will have to fix it. The pillow itself is not anything particularly special and the filler is visible through the white, but I still put it on my guest bed, I think it's fine with other pillows. - It's comfortable and a good weight and pretty much exactly what I was looking for. - The reviews helped me, so I could manage my expectations. If I hadn't read the reviews, maybe I would have been dissappointed with the color, or alarmed at the wrinkles at first. All the reviews were pretty much spot on and I'm very happy with this purchase. LOVE!!! Very elegant looking and the best part is you don't have to iron. I found this perfect for the draping look I was going for. I completed the look with White Sheer 100-percent Cotton Voile 15-inch Drop Gathered Bedskirt. My teen loves it! and so easy to make the bed. Nice heavy feel. Perfect for a teen girls room. I wavered for weeks on buying this bedding. By the photo, it was exactly what I wanted. But, I was scared away by some negative reviews- specifically the ones who felt it looked wrinkled and nothing like the photo. Well, I ordered the bedding anyway and couldn't be happier! It looks fabulous on my bed and is super comfortable to sleep under. Because I have a 2 inch memory foam on top of my king mattress, the comforter is a tad short on the sides, but I still love it! All the reviews are right on, not quite pure white, wrinkled, filling color shows through a bit, but I put it on my bed against white curtains with a white dust ruffle and I could not be more pleased. I have violet purple walls, with white woodwork, with all black accessories and it just pops against the color. The draped effect of the ruching is beautiful and luxurious. The queen size is very generous and covers my bed nicely, even though my bed is a queen size 16 inch pillowtop mattress, with a featherbed on top of the mattress. I have trouble getting queen size to fit, so i was worried about this one, but its perfect. Its a bit heavy, but i can manage that one little problem. After looking for a new comforter and reading the reviews on this one.... I decided it was the one for me. If you have a Queen bed definitely get the king. Just put it on the bed. It is a little wrinkled, due to the packaging, but will be fine in a day or two. Purchased 2 inexpensive pillows for the shams... since you need king size ones. 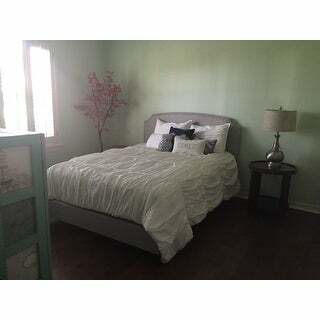 We also have 2 green Euro pillows that we are using from our old comforter to accent. Looking forward to enjoying this for a long time... Hope you enjoy yours, like I am going to enjoy mine. I really like this set. I thought I was ordering a Duvet cover, but I accidentally ordered this and decided to keep it. It is a nice heavy comforter, and it lays on my bed just like the picture. It isn't as wide as I had hope, and doesn't hang over the side of my bed as long as I would like. Other wise, I like it a lot. Sophisticated ~ Elegant & Perfect! I bought this set for my college daughter wanting a serious bedroom makeover and get that sophisticated-elegant look. We had seen the "look" she wanted in a very expensive, trendy brand. We found this set and it is every bit as awesome as the higher price version. 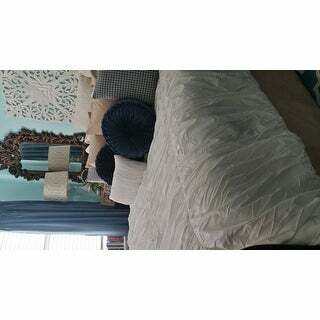 She wanted the white comforter with a deep grey wall color accented in Tiffany blue!! It looks amazing !! She's ready to post it to Pinterest... You can't go wrong with this set, we got the queen size for her full bed. It's very thick and plush, but not too heavy. The gathering of the comforters design is well done and the bed is super easy to make. I am in love with this comforter set. I researched for a long time before buying and I'm so glad I did! The shams are beautiful and fit perfectly, and the comforter is the fluffiest thing I've ever seen. I would 100% recommend this to anyone! I bet that some people are just unhappy and complain about things and that I would go with the positive reviews. Well I was wrong. This is horrible. Mine looks nothing like the picture and now I have to figure out a way to repack it and get it send. There were no lovely folds. it was like a wrinkled mess and you would never guess that it looked like the picture. The fabric seems cheaper than expected too. I would not recommend. The bedding set is nice. The white is not the bright white the is pictured but is more of a muted ivory. The fabric wrinkles very easily and noticably from washing and drying them at home. The comforter does not extend far enough on both sides to cover the bed properly. would not necessarily buy this again. My sister bought this for her new place and was disappointed in the quality. She gave it to me to use in my guest bedroom. The fabric feels like a coarse muslin with a low thread count (thin)and that allows the color to darken due to the filling. It is a beautiful white with well stuffed ruching in the advertisement image, but it does not look like that in person. The design is pretty, but not gorgeous as presented. A lot of other reviews say the comforter wasn't as crisp of a white as they were hoping, but I thought it was pretty close to the picture. It is a perfect weight and the filling is evenly dispersed throughout. I am very happy with this purchase and I have had many compliments on it! I purchased this item for my bed. Was concerned about some of the unfavorable reviews but I was pleased with the set I received. Good fabric quality, needs some ironing if you choose. Only negative is the color white is slightly off. It not a bright white but more an off white or an in between color. I love it and Im keeping it. I gave it 4 stars due to the color variation. It makes a statement in the room. It's more of a cream color and I was looking for something crisp white. It also comes very wrinkled and while it says not to iron, I had to run the iron through it a little. I ordered this and washed it right away according to the directions. When it came out of the washer it was splotchy, white with yellowing. I had thrown away the packaging, thinking that I really liked it and was worried I wouldn't be able to return it, but they let me put it in a different box and return it. I received my full refund, less the shipping cost. While I was not pleased with the comforter, kudos to overstock for making it right! Nice, think fabric but I should've measured better as it hangs shorter on the sides than I had anticipated. Beautiful and fluffy comforter set. It is a true white and it fits the full/queen bed perfectly. I get lots of compliments on this set. Highly recommend. However beautiful this may look the durability of this product does not stand up. I order this on two different occasions and both times it fell apart upon washing and drying. It is still on my daughter's bed with the holes in it. I love this comforter set, it is beautiful and looks very expensive although it wasn't expensive at all. It comes with Pillow Shams that put such a nice finish to the look. I will buy bedding again from Overstock, their prices are very reasonable. Love, love, love this gorgeous comforter set. I’ve had it for quite awhile now, but it is just as beautiful as when I first purchased it. I’ve recently seen it at a few staged open houses. Thank you, Overstock, for making such high quality merchandise available at such reasonable prices! Nice quality for the price and warm. Decent for the value. Goes well with anything! "Can you recommend a bedskirt that matches or would be close in color?" "will this comforter cover the sides of my bed? I have a queen." It would depend more on the height of your mattress. The queen size is approximately 90 inches wide x 90 inches long and the king is approximately 104 inches wide x 92 inches long. I have a Queen Pillowtop Matress on a box spring/canopy bed and before that had a 12" foam mattress on a platform with full size drawers underneath, I always tend to buy King Comforters because I like them big. My King size comforter does/did NOT hang on the floor. "Is here a dust ruffle to match this set? Madiso Park Catalina"
Hello Corrine S., no there is not a matching dust ruffle, but there are quite a few on our website that would look good. Thanks for shopping with us. Going for the shabby chic look for our master bedroom. My daughter liked it because it was stylish. "Do you think the Twin set would be long enough for a Twin XL bed?" Thank you for contacting us beccaleahy. The Twin XL mattress size is 5 inches longer, it is 39x80 inches. This comforter length is 90 inches long. So it will fit on a Twin XL bed. Please let us know if you have any further questions. "Does the king size comforter set come with standard pillow shams or king-pillow shams?" Hello, austindbuckley. The pillows and shams are standard. Here are those dimensions. The Shams: 20 inches wide x 36 inches long; The Pillows: 12 inches wide x 18 inches long; I hope this information helps! Thanks for shopping with us! l.b. "Do you ship to Australia, I am prepared to pay for the postage"